Do you sometimes think beyond your everyday problems, your work, and the people you know? Do you limit your awareness and thoughts to your immediate surroundings only? At times, you expand your awareness a little, when you listen to news about the world, read the newspapers, or watch TV. However, you can expand your awareness even more. This would give a sense of peace happiness and inner strength. When you look around you, what do you see? You see people of various nations, religions and groups, some living in harmony with others and some not in harmony. Some hate or fight each other and others try to live in peace. You see people with problems, living with anxiety and stress. You also see people with aspirations, ambitions and hopes. Each person thinks and sees the world through his or her mind, through their mental programming, and through the filters of their individuality and ego. Each person views the world trough different lenses, programmed by one’s upbringing, education, country, religious affinity and nationality. It is like looking at the world through colored eyeglasses. Each person lives within a certain world, which is often the only reality he or she knows. Sometimes, you might also meet people, who try to expand their consciousness beyond their small and known world. These people want to experience a wider and bigger awareness, without limitations. Have you tried to expand your consciousness beyond your well-known world? You do not need to spend money to expand your consciousness. You do not need to travel to some distant place, or live in a cave, in an ashram, or in a monastery. You can get a glimpse of this expansion of awareness and a glimpse of spiritual awakening here and now. In time, this would be more than a glimpse, but this requires some inner work on your part. What is the inner work that you need to do to get a glimpse of spiritual awakening? You need to learn to focus your mind, calm your mind, and to look within you. How do you do this? The most helpful practice for expanding your consciousness, beyond limitation and mental programming is meditation. I would like to suggest a certain kind of meditation that will help you expand your consciousness and get a glimpse of spiritual awakening. It is something you probably have never done before. To practice this kind of mediation, you need some mental focus and the willingness to step out of your comfort zone and limited thinking. Before starting, I would like to ask you a few questions. What do you feel and think when you read about far away stars and galaxies? How do you feel when you look at pictures taken in space? Do you feel how small Earth is and how petty and not so important are all the problems and many of the experiences you go through? Do you, at such moments, see the meaningless of certain ideas and beliefs? Do you realize how many of the ideas, ambitions, desires, feelings and thoughts come from the ego and are meaningless? 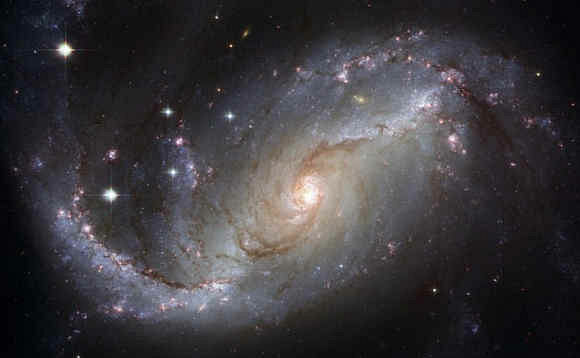 Some people might feel inconvenient when watching such photos, since they make them feel so small in the vast Universe. I have asked you these questions, since the meditation below has much to do with space. 1. Sit down and look at the picture of the galaxy above, for a minute or two. 2. Now, close your eyes and imagine your consciousness expanding, filling all space around you, growing and going beyond this planet, and then beyond the Solar System, and beyond this galaxy. It is as though your consciousness is filling all space. 3. Let your consciousness expand without limits, further and further away. “Where am I now? Who am I? 5. Stay for a few moments in this state of awareness, and then slowly bring your consciousness back to Earth, and to your body and familiar world. 6. Wait a moment before opening your eyes and getting up. How do you feel now? How is the state of your mind now? Do you feel restless or calm and poised? If you repeat this meditation once a day, even for just a few moments, you will notice a big change in your attitude toward the world and toward life. You will learn not to take things too personally, and become a little more detached toward the things that do not really matter in your life. This will bring peace and happiness into your life. Your perspective, and the way you see your life and the world around would gradually change. You will experience something similar to spiritual awakening. Your consciousness would expand beyond the ego, beyond the personality, and beyond your known world. Spiritual awakening is like expanding your consciousness beyond limits. It is like bursting into outer space, beyond the body and ego, beyond Earth, beyond the Solar System and beyond our Galaxy. This is exactly what you do in this meditation. It this state, your Consciousness, which is the real you, is not tied down by your individually and the world in which you live. This awareness, which you experience through this meditation, is like a mental and spiritual awakening that takes you beyond mental, emotional and physical barriers. In this experience, enjoy a state of bliss and inner peace. You experience a glimpse of higher awareness. If you continue to practice this meditation, or any other kind of meditation, you will be aware of more than a glimpse of spiritual awakening. Your consciousness would expand, and you will have this experience more often. What Are the Benefits of Spiritual Growth? How Can I Pay Better Attention when I Work or Study?